When they are healthy, your sinuses are clear and filled with air. However, when they get blocked up, they become filled with germs and fluids that may cause infection. Inflammation in the sinuses can hinder the drainage of mucus which increases pressure in the sinuses leading to a sinus headache. Nasal polyps which are small growths within the lining of your nose. • A feeling of pain or pressure in the forehead, cheeks and brow areas. • Elevated pain levels when you bend or lie down. • Aching in the upper teeth. Sinus headaches are often confused with migraines but unlike migraines, a sinus headache does not cause nausea, vomiting or bright lights in the vision. 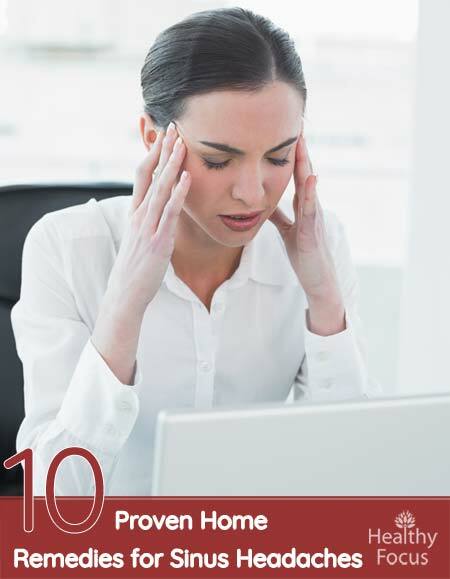 Despite these differences, there are many similarities and studies have shown that some 90% of people that visit a doctor believing they have a sinus headache are actually suffering from migraines. For a sinus infection, your doctor might recommend using a simple saline wash or a decongestant medication. Over the counter decongestants should not be used for any more than three days since they can cause you to become even more congested. Your doctor may prescribe a course of antibiotics which will last around 10 to 14 days. Unfortunately, the over prescription of antibiotics has led to a major health issue. Many bugs are becoming resistant to antibiotic treatment and so called ‘superbugs’ are on the rise. According to experts, the vast majority of sinus infections are viral with only 2% caused by bacterial infection so it is highly unlikely that antibiotics will be effective in most instances. Warm and moist air can also be beneficial for people suffering from chronic sinusitis. Either use a vaporizer or inhale steam directly from a pan of hot water. If you have suffered from regular sinus headache, you will probably know that your sinuses are the spaces surrounding your nasal passage which help mucus secretion and air humidification. Your sinuses can become inflamed for many reasons including respiratory conditions like the common cold or allergic reactions. When his occurs, the sinuses are inflamed and not able to effectively drain mucus which leads to increases pressure and sinus headaches. Treatment depends on decreasing inflammation in the sinus passages which leads to improved mucus drainage and reduced pressure. Doctors often prescribe antibiotics or anti-inflammatory medications but there are a number of more natural and safer home remedies that can be just as effective. If you suffer from sinus headaches and you would like to give natural treatments a shot, then read on. When it comes to nasal congestion caused by the common cold or sinusitis, steam inhalation is extremely effective. The moist air that you inhale moistens your nasal passages, clears up the blockage and opens up your sinuses. This helps you to breathe better and allows for mucus to be drained away more easily which in turn relieves sinus pressure and headaches. Note: You can add the essential oils that we discuss later in the article to your water for even greater effect. • Cover your shoulders and head with a towel and lean over the bowl. • Be careful not to get too close too close to the hot water in case you burn or scald yourself. • Inhale the steam through the nose for up to 5 minutes if you can tolerate it. You might be familiar with the phrase that here is an essential oil for everything. In which case, it will not come as a surprise the several essential oils are very effective in treating sinus headaches. Some of the most effective essential oils include peppermint, eucalyptus and tea tree oil. Peppermint oil is high in menthol and has antiviral and anti-inflammatory properties perfectly suited to relieve sinus congestion as well as headaches. It also has a wonderful cooling effect and works as a natural pain killer. Eucalyptus oil contains a high concentration of cineole which helps relieve inflammation and free the sinuses of congestion. Tea tree oil is one of the most versatile of all the essential oils. It has powerful antibacterial and anti-fungal properties that can cure the headache itself and treat any underlying infections. Thyme, clove and cinnamon essential oils are other excellent choices. • One very effective method is to add a few drops of your chosen oil to your steam inhalation as described above. • If you are on the go and don’ have the time to prepare a seam inhalation, you can simply inhale a few drops of your oil from a handkerchief whenever you feel the need. • Another method is to dilute your essential oil in a good quality base oil like coconut or olive oil and then simply massage it into your affected regions like the cheeks, forehead and sides of the nose. 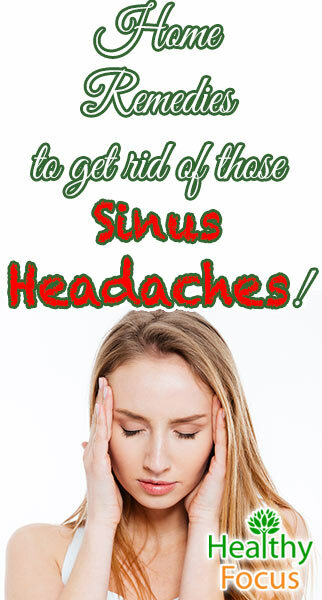 Sinus congestion leads to a huge build-up of pressure which causes the painful sinus headache and other nasty symptoms. Applying hot and cold compresses alternately is an excellent remedy for headaches caused by this build-up of pressure. A warm compress allows moist heat into the sinus passages which relieves any pressure and loosens mucus while a cold compress helps relieve pain caused by constricted blood vessels. • Soak a face towel in hot water then wring out the excess. • Fold and place the towel over your face making sure your nose, cheeks and forehead are covered well. • Leave it in place for between 3 and 5 minutes. • Now remove your towel and soak it in very cold water. Again wring out any excess. • Fold hen place it over your face for around a minute. • Repeat the process 3 times daily for best effect. Holy Basil contains euganol, cineole and camphene all of which help clear sinus congestion and reduce any inflammation. Holy basil also has expectorant properties and can help eliminate phlegm from the chest. It is also antiviral and can effectively fight the infection causing sinusitis and sinus headache. Holy basil is used in conjunction with ginger in Ayurvedic medicine to treat sinus headaches and also sinusitis itself. You can prepare this traditional treatment at home by following these simple steps. • Take a handful of basil leaves and a peeled ginger root. • Crush the basil and ginger into a paste with a pestle and mortar. • Bring 2 cups of water to the boil and add he paste. • Strain the liquid and add a little honey to taste. • Drink this tea once or twice a day. Irrigating your nasal passage with salt water is a simple but very effective way of treating your sinus headaches. The best way to irrigate is with a Neti pot or bulb syringe kit both of which you can easily find at the pharmacy. • Add a quarter teaspoon of salt and a quarter teaspoon of baking soda to a cup of warm distilled water. • Put the solution in your bulb syringe or Neti pot. • Introduce the solution to your nostrils one at a time then drain out the water and mucus. Ginger root is another great remedy for sinus congestion and headaches. It possesses anti-inflammatory agents that can alleviate swelling and ease your headache. It is very easy to make a nice cup of soothing ginger tea-it tastes great too. • Peel and slice one piece of fresh ginger root. • Boil a cup of water then pour the water over your sliced ginger. • Allow it to seep for at least 10 minutes. • Drink it down slowly and inhale its therapeutic vapors. • Aim for at least 3 cups daily. Apart from its great flavor and fragrance, cinnamon contains euganol and has powerful medicinal properties. It is a powerful anti-inflammatory, antibacterial and antiseptic. Cinnamon is also a popular traditional remedy for respiratory complains including sinus congestion. Because of its excellent anti-inflammatory properties, it can help relieve swelling and open up the air passages thus relieving your headache. There are a variety of ways to use cinnamon to treat your sinus headache including the following. • You can add cinnamon essential oil o your steam inhaler. • Make a soothing cup of cinnamon tea with a cinnamon stick. • Add a pinch of cinnamon powder o your hot drink. Spicy peppers are one of the oldest and most traditional remedies for a sinus headache. Peppers contain an anti-inflammatory compound called Capsaicin that helps relieve sinus swelling and loosen mucus. There are aplenty of ways to use peppers to treat a sinus headache. Simply add a good pinch or 2 of chili pepper to your soups or broths and inhale the vapors as you eat. Add a pinch of cayenne or black pepper to your herbal teas. Not everybody is able to tolerate it, but chewing on a jalapeno pepper is said to be very effective. Bromelain is a protein that is found naturally in pineapple fruit and stems. Sold in supplementary form it has been used by boxers and fighters to relieve swelling. Its anti-inflammatory properties may make bromelain a useful home remedy for sinusitis and sinus headaches. According to experts, bromelain seems to be beneficial in reducing inflammation within the nasal passage. Bromelain is readily available these days in supplementary form. Speak to your doctor before taking these supplements and make sure you follow the correct dosage instructions. Staying well hydrated is very important to your health in general and can definitely help overcome sinus issues by keeping the sinuses nice and moist. Make sure that you get plenty of water into your system during the day and stay well clear of both alcohol and caffeinated drinks because they cause dehydration. While the recommended fluid intake is often given as 8 glasses a day, the optimal intake varies from person to person and depends on a number of factors including gender and body weight. You can tell if you are drinking enough water if your urine is clear. • Stay well hydrated and make sure you get plenty of fluids. • Use a humidifier if you have one. • Avoid activities or known allergens that may trigger a sinus headache. Sinus headaches are caused by inflammation and blockage of the sinuses. There are many potential causes including infection, common cold and allergies. Traditional antibiotic treatment is ineffective for the vast majority of sinus headaches. Staying hydrated and using steam or heat treatments can be very effective in aiding your recovery. Some of the best home remedies include inhaling essential oils to clear the sinuses. Other excellent remedies include cinnamon, ginger and spicy peppers.